People increasingly expect quality food, rapid delivery and the possibility to verify the production chain and measure their consumption; likewise, they want to enjoy meaningful gourmet experiences, whether at restaurant, at home, or when invited to friends’ homes, but the ingredients must be ‘special’ yet ready to use. Thanks to digital technology, many of these desires can be satisfied. 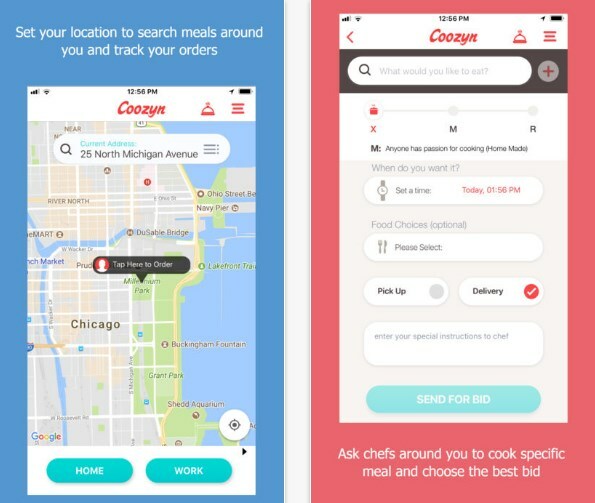 Let’s take a look at one of the best food apps for consumers, called Coozyn. Coozyn is a beautifully designed, intuitive and easy-to-use food tool for users that are looking for an easy way to order their favorite food. If you want to enjoy a convenient and fast ordering and delivering delicious foods from chefs or from local food restaurants, then this app is a perfect choice for you. With Coozyn you can look for the meals you want from chefs (home, professional and even celebrity chefs) or food businesses (restaurants, food trucks, etc.) with an ease. It lets you order food and track it in a seamless way, save your favorites, choose your food to be delivered or not, pay with Apple Pay or Credit Card, add multiple items in your food basket, etc. With this incredible app you can order whatever you like, anytime you like! Simply search and order meals through the app. Even if you don't know from where to order, just enter what you like to eat and the app will take care of the rest! The creators of this amazing app have also brought us Coozyner and Coozyn Pilot. Coozyner is n app especially developed for food sellers and businesses. With this app users can easily include the meals they’re making, add their food brand and let other people place food orders. The Coozyn Pilot app actually helps in delivering orders around your city, so you can use it for making money on your schedule. Whether using your car, on foot, bicycle or public transportation, you can select any of the options and start earning right away. This way you will collaborate with food sellers (from Coozyner app) and start delivering specifically for them. Coozyn and Coozyner are on the cutting edge of flavor, technology and convenience. You can download the apps for free from the following App Store’s links.